On September 10, 2001, then Secretary of the Department of Defense Donald Rumsfeld said that for the 1999 DOD budget, “According to some estimates, we cannot track $2.3 trillion in transactions.” The War On Waste The following day the US sustained the terrorist attacks that forever changed our world, and this startling revelation was largely forgotten, until recently. By 2015 the amount reported by the Office of the Inspector General (OIG) had increased to $6.5 trillion for the Army only. Pentagon’s Sloppy Bookkeeping Means $6.5 Trillion Can’t Pass an Audit Dr. Mark Skidmore, Professor of Economics at Michigan State University, thought this made no sense and suspected an error in media reporting. Looking into this issue by using data published on the government’s own websites, he found that $21 trillion in unsupported adjustments have been reported by DOD and the Department of Housing and Urban Development (HUD) for the years 1998-2015. That’s $65,000 for every person in America. Has Our Government Spent $21 Trillion Of Our Money Without Telling Us? According to a 2013 Reuters report, “The Pentagon is the only federal agency that has not complied with a 1996 law that requires annual audits of all government departments. The Pentagon has spent tens of billions of dollars to upgrade to new, more efficient technology in order to become audit-ready. But many of these new systems have failed, either unable to perform all the jobs they were meant to do or scrapped altogether. In a December interview on USAWatchdog, Dr. Mark Skidmore – $21 Trillion Missing from US Federal Budget an online news outlet run by former CNN and ABC News correspondent Greg Hunter, Dr. Skidmore said he frequently consults for local governments, and undocumentable adjustments, while common, are never more than one percent of the budget. In the case of the Army in 2015, the adjustment was over 50 times their budget for that year. Of the missing $21 trillion he discovered, 11.5 trillion was for the Army, usually on the expenditure side. But in the 2016 OIG report for 2015, he found a single transfer from the Treasury to the Army of $800 billion when their budget was only $122 billion. The additional $688 billion had not been appropriated by Congress, and the Army doesn’t know what it was spent on. Mark Skidmore: “For me it’s like how can we have these kinds of adjustments and this massive amount of money? It doesn’t make sense to me. And that’s why I’m willing to step up and say, let’s just ask some questions. Mark Skidmore: “I cannot discount it. Absolutely. It’s very probable. In fact, I referenced a journal article that says whenever you have a significant amount of unsupported journal vouchers that’s a red flag for fraud, whether it’s private or public. That’s not just me. It’s in the literature. Four days after this interview, the Department of Defense announced it will conduct the first department-wide independent financial audit in its history. MSU scholars find $21 trillion in unauthorized government spending; Defense Department to conduct first-ever audit. $21 trillion is equal to 40% of all federal expenditures from 1998 to 2015, and three time the total DOD budgets from 1998 to 2015. And the amounts have been increasing. The $9.3 trillion missing from the DOD in 2015 is the largest amount for one year since data became available in 1998. The military doesn’t know how its budget is being spent. Total military expenditures are what Treasury says they are, and the individual line items, at least for the Army, are for the most part unknown. If money is being secretly diverted from the armed forces, our defense capability is being degraded in ways that are difficult to observe. Repeated fixes to the system have not solved the problem despite the availability of talented and conscientious people. If the Treasury gives the Army a money transfer equal to six times its budget outside the congressional appropriations process, then the military is effectively being used to launder the funds. And where did that money come from? Did the Federal Reserve create it with a computer entry? Is the Fed printing trillions of dollars in secret? There appear to be at least five possibilities: 1-The missing money was spent appropriately, but existing accounting infrastructure is incapable of tracking it. 2-The money was “wasted,” i.e. spent unwisely. 3-The money was directed into black projects and Special Access Programs in massive amounts outside the Constitutional appropriations process, and therefore without the knowledge of Congress and the citizenry, for purposes unknown. 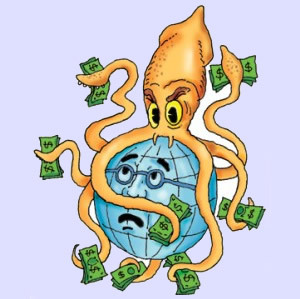 4-The money was used to manipulate markets to maintain the reserve status of the dollar. 5-The money is being stolen by fraud and collusion between government and private interests. Or perhaps a combination of all of these. We must recognize the possibility that massive fraud is being perpetrated against the American people. If that is not the case, it would take relatively little effort and expense to put that concern to rest. On the other hand, what malfeasance might investigation reveal, and who might be responsible? At the very least, we should be asking the secretaries of DOD, HUD, and the Treasury, the chairman of the Federal Reserve, and the President of the NY Fed what they know, and we need independent audits of all those entities plus the Exchange Stabilization Fund. Anything less will be to acquiesce in an ongoing financial coup d’état.